17-yr-old sells child for N500,000, paid N30,000 - BlogIT with OLIVIA!!! 17 year old Tessy Obianua, a secondary school drop-out ate the “forbidden fruit”and was made pregnant by one of her acquaintances, Shola. 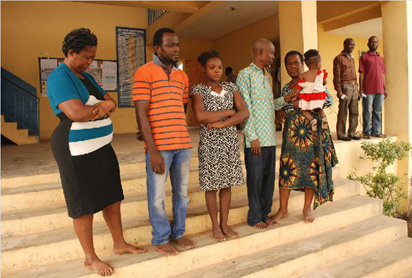 The shame led her to elope when the pregnancy was five months old and the protruding tummy was becoming a source of embarrassment for her and her parents at their Ogbese camp in Akure North area of Ondo State. Without the knowledge of her parents Mr and Mrs Henry Obianua , Tessy left with another man Jude Azuka for Onitsha, to escape the prying eyes of neighbours and others who may jest of her. The father was said to have been flabbergasted when Tessy who disappeared with the five month old pregnancy re-surfaced after nine months without a baby which was the evidence of the pregnancy. Meanwhile, when Tessy disappeared, the father had lodged a complaint via a petition at the Police station that her pregnant daughter was missing and detectives were deployed to smoke her out with the pregnancy. But a Police source hinted that Jude who was a neighbour of Tessy’s parents seized the opportunity of her condition to lure her to Onitsha where he promised to link her to a “ good Samaritan” that will take care of her,the pregnancy and even the baby after birth. Tessy was ferried to Onitsha and put in the custody of Mrs Chibuzor Okoye who housed her until she gave birth to a baby girl which she also helped her nurse. Unknown to Tessy that Jude was one of the agents of Mrs Okoye who is a child trafficker, she was reportedly given special treatment throughout her stay with the Mrs Okoye at No 3 Tonny Olisa street Awada in Onitsha. When she was put in the picture of what would be the fate of her “unwanted child” Tessy according to the Police source had no choice than to agree with them. While Tessy and the little baby were enjoying the luxury provided by Mrs Okoye, a deal had been struck on how much a desperate couple who had been looking for a baby was willing to pay on her. Police source told Vanguard that a drama ensued when the couple came to the house of Mrs Okoye to collect the baby after the payment of N500,000. Tessy was said to have put up a fight, vowing she would not let go her baby and it reportedly took the intervention of Jude who brought her to Onitsha before she allowed the couple Mr and Mrs Sunday Kalu to go with her. Sensing that Tessy may have a re-think and probably want to make trouble, they suggested to both Jude and Mrs Okoye that she (Tessy) should sign an undertaking that she would never come back for the baby. After that was done, the baby was taken away and Tessy was settled with N30,000 cash while some new clothes and shoes were equally bought for her from the sale of her baby girl. But the 17-year old girl in an interview denied having knowledge of the whole transaction saying she was handed N30,000 after she discovered that her baby had disappeared while she was asleep. She said that she later learnt from Jude that N500,000 was collected by them from a couple in need of a baby. Tessy told Vanguard when she was paraded alongside with four other suspects of the child trafficking and the couple that Mrs Okoye and Jude should be held responsible for the disappearance of her baby. She said because she was not in support of the sale of the baby that was why she exposed the child trafficker to her uncle who informed the police and she was arrested. The story told by Mrs Okoye differed as she told Vanguard that Tessy was lying and that she was handed over her share of the money while Jude also collected his share. She said that N200,000 was given to Jude out of the sales while she took N300,000. The burble reportedly burst when Tessy after she re-surfaced didn’t come with a baby and the father became suspicious and raised alarm. Vanguard learnt that she later confessed that their neighbour, Jude and one Mrs Okoye sold her baby girl to a couple in Onitsha, Anambra state. Detectives later traced both Mrs Okoye and Jude to Onitsha where they were both apprehended and brought back to Akure, the Ondo State capital. The five suspects are presently cooling their heels at the Criminal Investigation Bureau CID division of the state police command.